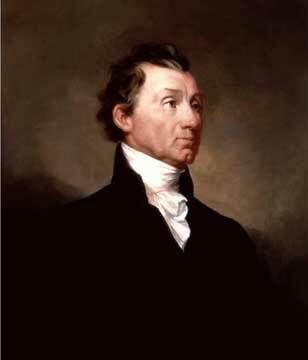 James Monroe was born at Monroe's Creek in Westmoreland County, Virginia, to a father of Scottish and a mother of Welsh descent. From the age of 11 to 16 he studied at the Campelltown Academy. When James was 16, his father died. That same year, 1774, he began his studies at the College of William and Mary. The fever of the Revolutionary War sweeping the country was not conducive to studies, and in 1775 he dropped out of school. He joined the Williamsburg Militia and eventually the Continental Army. Monroe had a distinguished career ,and rose in rank from Lieutenant to Lieutenant Colonel. He fought in the battles of Harlem Heights, White Plains, Trenton, Brandywine, Germantown and Monmouth. From 1780-82, he studied law under Thomas Jefferson. From 1783-1786, Monroe served as a member of the Continental Congress. In 1790, he became a US Senator from Virginia. Four years later he became Minister to France. In 1796 he was recalled by Washington for not publicly defending the Jay Treaty with Great Britain. From 1799-1802 Monroe served as the Governor of Virginia. In 1803 he assisted US Minister Robert Livingston in negotiating the Louisiana Purchase. From 1803-1807, Monroe was Minister to Great Britain, a job that he found increasingly difficult as he was not successful in convincing the British to abandon their policy of impressment of US citizens, the largest problem in US British relations. In 1811 he was appointed by President Madison to Secretary of State. He at first tried to avert the impending war with Great Britain, but soon felt that the war was unavoidable. When the British landed on the Maryland coast, he personally led a force of scouts and determined that the British were headed for the city of Washington. Monroe ordered all essential documents removed from Washington. After the British retreat, he was appointed Secretary of War, while maintaining his position as Secretary of State. Monroe's Presidency was once coined by a Boston newspaper as the "era of good feeling," and the term stuck. This was as a result of Monroe's great personal popularity, and because he retained neutrality in regional disputes. He began his term by making a tour of New England, the center of support for the Federalists. Despite this era of good feeling, the underlying issues which would eventually result in the Civil War arose during Monroe's Presidency. The petition to admit Missouri, a border state, as a slave state brought those issues of the fore. Monroe signed the Missouri Compromise in 1820, which admitted Missouri as a slave state, and Maine as a free state. While personally a supporter of the rights of the free states, Monroe took no public position on the issue. Monroe was the first President inaugurated on March 5th.